Zongkar Choede Monastery is historically one of the oldest monasteries in Tibet. It was established in western Tibet, Mang-yul upper Gung-thang region, in 1270 by the Tibetan king Tri-bum-de-gon, who was the last great scion of Tibet’s royal descendants. The king built the monastery facing opposite to his palace Phodrang Khunzong Karpo (“The White Nest of Eagles”). The monastery, through the time, became a thriving spiritual community in western Tibet and also became a focal point of Tibetan civilization. Over the time it emerged as one of the largest repositories of Tibetan folk and monastic art, music, dance, artefacts and spiritual training. There existed upper and lower Zongkar Choede within the same wall, each having over 300 monks. The inmates followed Buddhist studies, meditative practices and tantric ritual arts. Hundreds of highly realised monks dedicated their lives for the continuation of the monastery to date. In the tumultuous decade that followed between 1950-1959, the peaceful land, its people and all their way of life fell under the communist Chinese. The destruction reached its climax during the Cultural Revolution, which made Tibet native values and institutions the target of its fury. Zongkar Choede monastery was razed to the ground and monks had to escape. Of the original 600 monks of the monastic community of Zongkar Choede before the destruction, less than 5% survived to tell the tale. A decade and a half elapsed in this historical twilight to alive in exile. Reconstruction began in the lush green forests and farmlands of coastal South India near the Arabian Sea in 1972 under the auspices of His Holiness the Dalai Lama and the Government of India. Mud and bamboo thatches became living quarters, community kitchens and prayer halls for the new Zongkar Choede in exile. 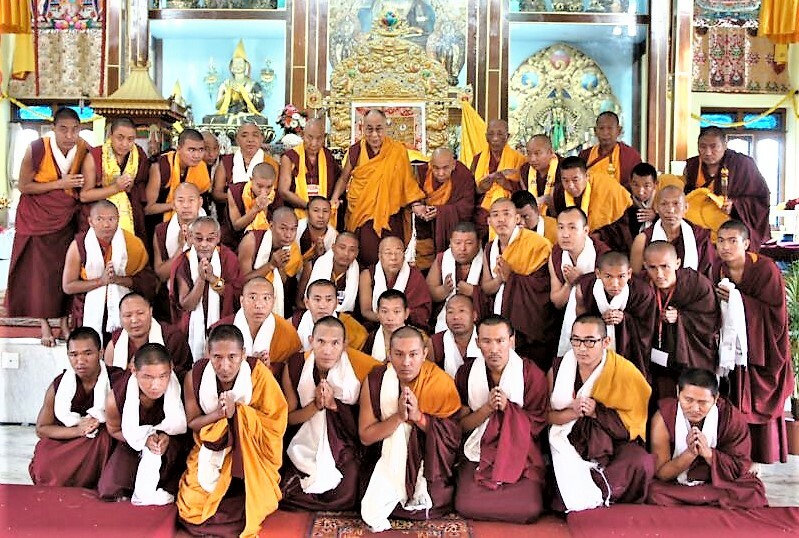 Today Zongkar Choede is a monastic community of 305 monks. It is an active cultural centre open to everyone. At the core of its monastic study programs is Zongkar Choede’s unique heritage: Tibetan monastic chanting, ancient Tibetan monastic ritual mask-dance, the art of butter sculpture, sand mandala, for which the monastery is renowned throughout Tibet and the world. The monks also study Buddhist logic and debate following Sera Jeh monastic university text. The monastery also runs a small school for the young monks providing modern education. There is also a small traditional Tibetan thangka painting class and traditional incense-making centre to preserve and promote Traditional Tibetan art and also to offer the job opportunity to young unemployed Tibetans. The monastery is fully dependent on devotees’ offering and sponsorship program for its young monks. It has not received any financial support/assistance from the State and government. Dzongkar Choede Monastery is one of the oldest monasteries in upper Tibet. It was founded in the mid ninth century in Ngari province, western Tibet by king Palden Rigpa Gon, who was the personification prophesied in the 7th century by Padmasambhava. Adhering to the traditional custom of their forefathers, the king erected Dzongkar Choede Monastery opposite to his white Castle Palace for the welfare of all the religious and living beings in general and especially against the irreligious forces from Toh-Hor. The popular name of “Zongkar” (i.e. White Castle) is derived from the name of the palace. Guru Lapchen Chopal Sangpo, who was the personification of Lord Hayagriva, became the first abbot of the monastery. This monastery (the largest in upper Tibet) encountered attacks from the Toh-Hor anti-religious force. To ward off the force, the Guru initiated special retreat and prepared sacrificial oblation for protection. During his retreat, a wonderful miraculous vision appeared to him. It was a joyful dance by the monastery’s chief guardian deity, Mahayaksha and retinue, Dharmapalas, guardian deities and the solitary Yamantaka in Yak-like form, all appearing to join in subduing the evil force. Clearly realizing it’s symbolic meaning, the Guru prepared his entire vision into a practice. The sacred monastic dance is preceded by an indoor performance of convocation, propitiation, commendation and reminding rites for full three days to general divine guardians. At the end of every month, and at the end of the year Dharmapalas are offered pujas in thanks for their service. On account of some attacks by Nepalese troops during the 17th and 18th century some obstacles to the furtherance of the Cham tradition were created. However, after 1789 the tradition was resumed by the abbot and performed until 1958 without any change. Never the less the Chinese invasion in 1959 reached Zongkar, and the atmosphere became gloomy when The Dalai Lama fled to India. So, in mid 1959 the monks of Zongkar departed from Tibet to Nepal, where they stayed for six years in 1967 they moved to Dharamsala, where H.H The Dalai Lama provided them a place to stay and study. Then, after four years they moved to Hunsur, South India, in accordance with the orders of the Home Affairs Office. There, by the grace of His Holiness The Dalai Lama and under the direct administration of Ven, Gonsar Tulku, the monastery recovered lost heritages and developed surviving traditions. In 1974 they built a simple temple and recruited new monks to stabilize the monastic traditions. During the Cultural Revolution, in Tibet the main temple, priceless statues, and the entire monastery were all razed to the earth by the Chinese. They had also destroyed the body of the first Guru from the ninth century, whose body had been preserved in a tomb. Reliable information collected found the body as if alive, growing hair and appearing to breathe. At present only four broken pillars weakly support the top of the ruined temple. The Monks of Dzongkar Choede are fortunate in preserving their entire monastic tradition in India. Even though it was eradicated in Tibet. It is all due to the grace of H.H The Dalai Lama, the Government of Tibet in exile, and the most warm hospitality extended by the Government of India, and the Indian people.